Water retention occurs when the body stores excess fluid in the tissues. Some women may experience mild water retention in the days or weeks before their menstrual cycle starts. More severe forms of water retention, or edema, occur when the body is unable to clear excess fluids through urine, or when the lymph system is no longer functioning properly. Severely obese people may also experience edema in the extremities as a consequence of the excess weight. Measure your waist at the smallest part — usually at or just above the navel. If you are a woman, and due for your period, your waist may swell. The swelling could occur anywhere from a few days to a few weeks before your period and disappear a day or so after your period starts, according to the Mayo Clinic. Press your thumb into your forearm and remove your hand. If you have edema, your thumb will leave an impression, or dent, in your skin for several seconds after you have removed your hand. Watch for puffiness or swelling in your face, hands and/or feet, the National Cancer Institute instructs. 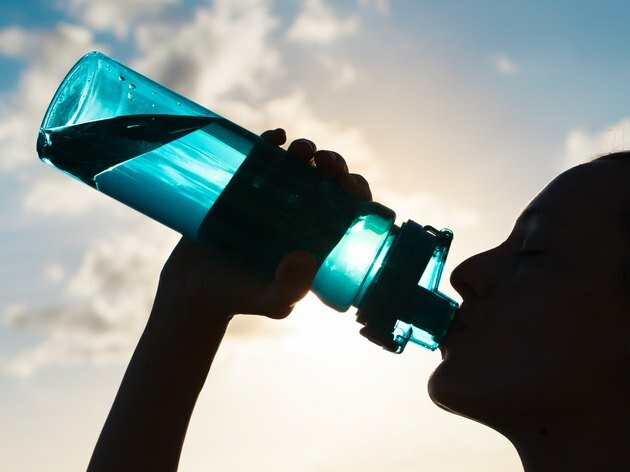 The skin may appear shiny and may feel stretched or bloated if you are retaining water. Consult your physician if you experience shortness of breath, an irregular heartbeat or difficulty urinating. Consult your physician if you experience sudden weight gain. Avoid eating high-sodium foods, which may trigger water retention. If you have frequent bouts of water retention, beyond monthly hormonal changes, consult your physician. Elevate your feet to encourage blood and lymph flow and relieve swelling, and take frequent beaks if you stand or sit a lot.